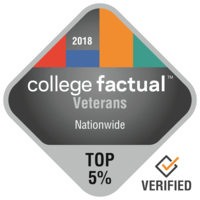 College Factual recently released their 2018 Best Colleges for Veterans Rankings. This is a ranking of four-year colleges and universities in the United States. Oregon State University has performed above average in this ranking. Oregon State is ranked 55 out of 1,421 for veteran friendliness of all colleges and universities reviewed by College Factual. This means Oregon State is in the top 60 Best for Vets school in the U.S. Oregon State improved its ranking position 24 slots over the previous year’s ranking of 79. Oregon State University is ranked 1 out of 19 colleges and universities reviewed by College Factual for veteran friendliness in Oregon. This means Oregon State is the best school for veterans in Oregon. Oregon State has achieved this ranking 2 years in a row.